For population case-control association studies, the false-positive rates can be high due to inappropriate controls, which can occur if there is population admixture or stratification. Moreover, it is not always clear how to choose appropriate controls. Alternatively, the parents or normal sibs can be used as controls of affected sibs. For late-onset complex diseases, parental data are not usually available. One way to study late-onset disorders is to perform sib-pair or sibship analyses. This paper proposes sibship-based Hotelling's T2 test statistics for high-resolution linkage disequilibrium mapping of complex diseases. For a sample of sibships, suppose that each sibship consists of at least one affected sib and at least one normal sib. Assume that genotype data of multiple tightly linked markers/haplotypes are available for each individual in the sample. Paired Hotelling's T2 test statistics are proposed for high-resolution association studies using normal sibs as controls for affected sibs, based on two coding methods: 'haplotype/allele coding' and 'genotype coding'. The paired Hotelling's T2 tests take into account not only the correlation among the markers, but also take the correlation within each sib-pair. The validity of the proposed method is justified by rigorous mathematical and statistical proofs under the large sample theory. The non-centrality parameter approximations of the test statistics are calculated for power and sample size calculations. By carrying out power and simulation studies, it was found that the non-centrality parameter approximations of the test statistics were accurate. By power and type I error analysis, the test statistics based on the 'haplotype/allele coding' method were found to be advantageous in comparison to the test statistics based on the 'genotype coding' method. The test statistics based on multiple markers can have higher power than those based on a single marker. The test statistics can be applied not only for bi-allelic markers, but also for multi-allelic markers. In addition, the test statistics can be applied to analyse the genetic data of multiple markers which contain double heterozygotes -- that is, unknown linkage phase data. An SAS macro, Hotel_sibs.sas, is written to implement the method for data analysis. In recent years, there has been great interest in the research of association studies of complex diseases [1–6]. 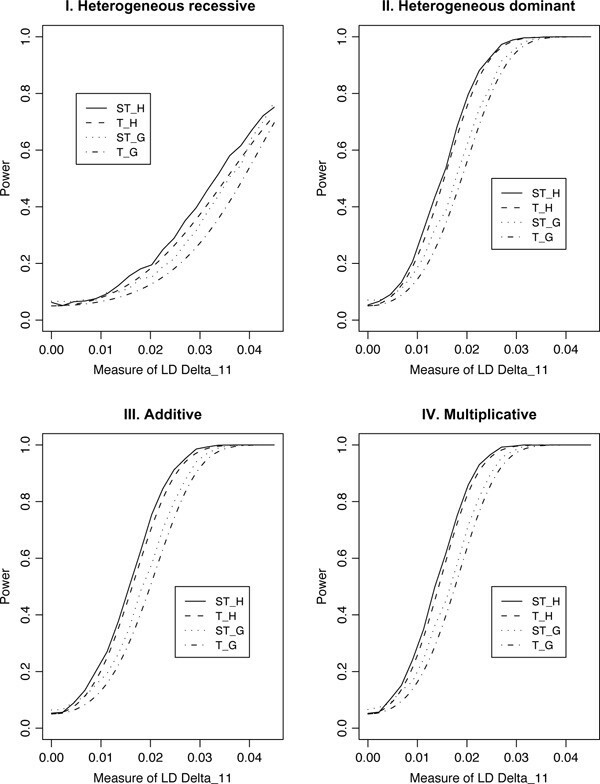 By association studies, we mean linkage disequilibrium (LD) mapping of genetic traits. For population case-control studies, the marker allele frequency in cases can be compared with that of controls using χ2 test statistics [7–11]. If there is association between one marker and the trait locus, it is expected that the χ2 tests would lead to significant results. Essentially, this method can be applied to analyse the data for one marker at a time. For multiple markers, the linkage phase may be unknown,  and the method cannot be applied simultaneously to analyse the data of multiple markers which contain double heterozygotes. With the development of dense maps such as single nucleotide polymorphisms (SNPs), haplotype maps and high-resolution micro-satellites in the human genome, enormous amounts of genetic data on human chromosomes are becoming available [13–15]. It is interesting when building appropriate models and useful algorithms in association mapping of complex diseases to have the ability to use multiple markers/haplotypes simultaneously. For tightly linked genetic markers, one may perform association studies of complex diseases based on the Hotelling's T2 test statistics . For population case-control data, Xiong et al. proposed two sample Hotelling's T2 test statistics to analyse genotype data of multiple bi-allelic markers such as SNPs;  in addition, logistic regression models were proposed [2, 18]. To analyse the multi-allelic micro-satellite or hap-lotype data, Fan and Knapp extended Xiong et al. method using two coding methods -- 'haplotype/allele coding' and 'genotype coding' . For the genetic data of nuclear families or parent-offspring pairs, paired Hotelling's T2 test statistics were proposed, in order to perform association studies based on multiple markers/haplotypes . For late-onset complex diseases, parental data are usually not available. One way to study late-onset disorders is to perform sib-pair or sibship analyses [21, 22]. 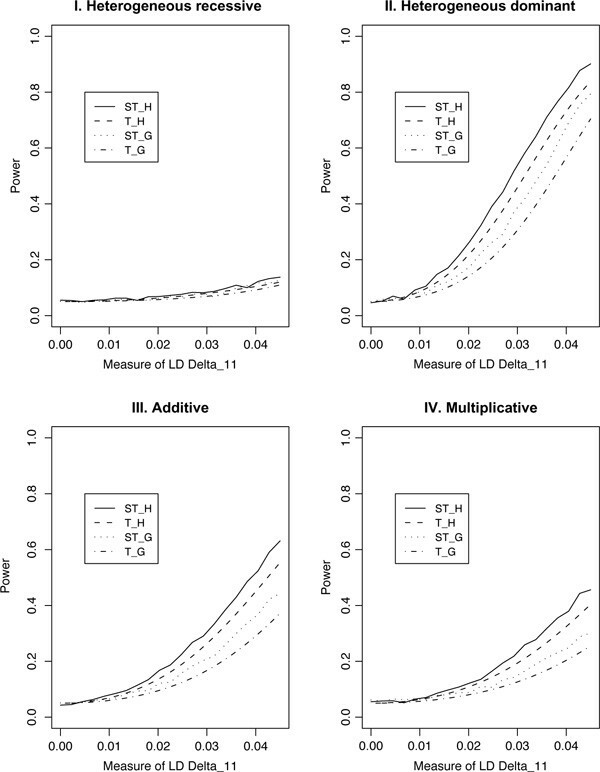 This paper proposes sibship-based paired Hotelling's T2 test statistics for high-resolution LD mapping of complex diseases. For a sample of sibships, suppose that each sibship consists of at least one affected sib and at least one normal sib. Assume that genotype data for multiple markers are available for each individual in the sample. Paired Hotelling's T2 test statistics are proposed for high-resolution association studies, using normal sibs as controls for affected sibs. The paired Hotelling's T2 tests not only take the correlation among the markers into account, but also the correlation within each sib-pair. The validity of the proposed method is justified by rigorous mathematical and statistical proofs under the large sample theory. The non-centrality parameter approximations of the test statistics are calculated for power calculations and comparisons; these are included in the section: Supplementary information: Non-centrality parameters. Type I error rates are calculated by simulations to evaluate the performance of the proposed test statistics. In the section: Supplementary information: Simulation study, the results from the simulation study are presented, to show that the non-centrality parameter approximations of the test statistics are accurate. An SAS macro, Hotel_sibs.sas, was written to implement the method and can be downloaded from the authors' website http://www.stat.tamu.edu/~rfan/software.html/. We assume that a disease locus D is located in a chromosome region. Suppose that the disease locus has two alleles D and d. Allele D is disease susceptible and d is normal. Assume that the disease-susceptible allele D has population frequency P D , and the normal allele d has population frequency P d .
In the region of the disease locus D, assume that J tightly linked markers H1, ..., H J are typed. By tightly linked, we mean that the markers are so close to each other that the recombination fractions among markers are 0. Let us denote the alleles of marker H j by H j 1 , … , H j n j , where n j denotes the number of its alleles. Here, markers can be micro-satellites or di-allelic markers such as SNPs or haplotypes. If H1, ..., H J are phase-known haplotypes, the methods developed in this paper are still valid, since the haplotypes can be treated as markers; but the related terminology needs to be changed accordingly. Usually, haplotypes consist of phase-unknown markers; in these cases, we prefer to analyse the genotype marker data directly, instead of estimating the haplotypes first and then analysing the haplotype data. The method developed in this paper can be used to analyse phase-unknown genotype data directly. Consider N sib-pairs, each consisting of an affected sibling and a normal sibling. We define coding vectors X i A and Y i U for the affected sibling and normal sibling of the i-th sib-pair, respectively, by one of the following two ways [19, 20]. Here and hereafter, the superscript τ denotes the transposition of a matrix or a vector. The dimension of X i A is n 1 - 1 + ⋯ + n J - 1 = ∑ j = 1 J n j - J , which is usually smaller than dimension ∑ j = 1 J n j n j + 1 / 2 - J of the following genotype coding method. (ii) Genotype coding: Note that G i j A can be one of n j (n j + 1)/2 possible choices: n j homozygous genotypes H jk H jk , and n j (n j - 1)/2 heterozygous genotypes H jk H jl , k < l. Depending on the genotype, let us define an indicator vector X i j A = x i j 1 A , … , x i j n j - 1 A , x i j 12 A , … , x i j 1 n j A , … , x i j n J - 1 n j A τ . Here, x i j k A is the indicator variable of genotype H jk H jk defined by x i j k A = 1 if G i j A = H j k H j k 0 else ; and x i j k l A , k <l is the indicator variable of genotype H jk H jl defined by x i j k l A = 1 if G i j A = H j k H j l 0 else . The dimension of x i j k A is n j (n j + 1)/2 - 1 -- that is, the total number n j (n j + 1)/2 of genotypes of marker H j minus 1 to remove the redundancy. Let X i A = X i 1 A τ , … , X i J A τ τ be the combined genotype coding of the J markers H1, ... H J . The dimension of X i A is ∑ j = 1 J n j n j + 1 / 2 - J . For the unaffected sibling of the i-th sib-pair, let G i j U be his/her genotype at marker H j . One may define a vector Y i U in the same way, based on either the 'genotype coding' or 'haplotype/allele coding' method. Table 1 in reference 19 gives an example of 'genotype coding' and 'haplotype/allele coding' for a marker with three alleles, to illustrate the above two coding methods. Type I error rates of N = 200 or 300 sib-pairs at a significance level α = 0.01 using one marker, H1, or two markers, H1 and H2. In model I, one bi-allelic marker H1 is used, P(H11) = P(H12) = 0.50. In model II, two bi-allelic markers H1 and H2 are used, P(H ij ) = 0.5, i, j = 1, 2, Δ H 11 H 21 = 0 . 05 . In model III, one quadric-allelic marker H1 is used, P(H21) = P(H22) = 0.35, P(H23) = P(H24) = 0.15. Abbreviations: df = degrees of freedom; Std Dev = standard deviation. S = 1 N - 1 ∑ i = 1 N X i A - Y i U - X ̄ A - Ȳ U X i A - Y i U - X ̄ A - Ȳ U τ = 1 N - 1 ∑ i = 1 N X i A - X ̄ A X i A - X ̄ A τ - ∑ i = 1 N X i A - X ̄ A Y i U - Ȳ U τ - ∑ i = 1 N Y i U - Ȳ U X i A - X ̄ A τ + ∑ i = 1 N Y i U - Ȳ U Y i U - Ȳ U τ . A paired Hotelling's T2 statistic can be defined as T 2 = N X ̄ A - Ȳ U τ S - 1 X ̄ A - Ȳ U [16, 23]. Let us denote the above Hotelling's T2 statistic for 'haplotype/allele coding' as T H , and the Hotelling's T2 statistic for 'genotype coding' as T G . Assume that the sample size N is sufficiently large that the large-sample theory applies. Under the null hypothesis of no association, the statistic T H (or T G ) is asymptotically distributed as central χ2 with ∑ j = 1 J n j - J ( or ∑ j = 1 J n j n j + 1 / 2 - J ) degrees of freedom. Under the alternative hypothesis of association, T H (or T G ) is asymptotically distributed as non-central χ2. For power calculation and comparison, the non-centrality parameter of statistic T H or T G can be derived under the alternative hypothesis of association. For general sibships each containing at least one affected sibling and at least one normal sibling, the Hotelling's T2 test statistics T H and T G above can be generalised as follows. Assume that N sibships are available. In the i-th sibship, assume that n i siblings are affected and m i siblings are normal. Let X ̄ i A and Ȳ i U be average coding vectors of affected and normal siblings, respectively. To be precise, let X i j A , j = 1, ⋯, n i be the coding vectors of the affected siblings of the i-th sibship. Then, X ̄ A = ∑ j = 1 n j X i j A / n i ; Ȳ i U is defined, accordingly. Utilising X ̄ i A to replace X i A and Ȳ i U to replace Y i U in the above paragraph and defining X ̄ A = ∑ i = 1 N X ̄ i A / N and Ȳ U = ∑ i = 1 N Ȳ i U / N , we may define the related Hotelling's T2 test statistics T H and T G .
The derivation of non-centrality parameters of sib-pairs is provided in the section Supplementary information: Non-centrality parameters. Tables 1, 2 and 3 show type I error rates of test statistics T H and T G at a significance level α = 0.01, using one marker H1 or two markers H1 and H2. Three models are considered. In model I, one marker H1 is used in analysis: H1 is a bi-allelic marker with equal allele frequency P(H11) = P(H12) = 0.50. In model II, two bi-allelic markers H1 and H2 are used in analysis, where P(H ij ) = 0.5, i, j = 1, 2, Δ H 11 H 21 = 0 . 05 . In model III, one marker H1 is used in analysis, where H1 is a quadri-allelic marker with allele frequencies P(H21) = P(H22) = 0.35, P(H23) = P(H24) = 0.15. Type I error rates of N = 200 or 300 sibships at a significance level α = 0.01 using one marker, H1, or two markers, H1 and H2. The number of sib-pairs is equal to N/2; in each sib-pair, one sibling is affected and the other is normal. The number of sibships of size 3 is N/2; in each of N/4 sibships of size 3, one is affected and the other two are normal; in the remaining N/4 sibships of size 3, two are affected and the other one is normal. The other parameters of each model are the same as those of Table 1. Abbreviations: df = degrees of freedom; Std Dev = standard deviation. The number of sib-pairs is equal to N/2; the number of sibships of size 3 is N/5; and the number of sibships of size 4 is 3N/10. In each sib-pair, one sibling is affected and the other is normal. In each of N/10 sibships of size 3, one is affected and the other two are normal; in the remaining N/10 sibships of size 3, two are affected and the other is normal. In each of N/10 sibships of size 4, one is affected and the other three are normal; in each of N/10 sibships of size 4, two are affected and the other two are normal; in the remaining N/10 sibships of size 4, three are affected and the other one is normal. The other parameters of each model are the same as those of Table 1. Abbreviations: df = degrees of freedom; Std Dev = standard deviation. 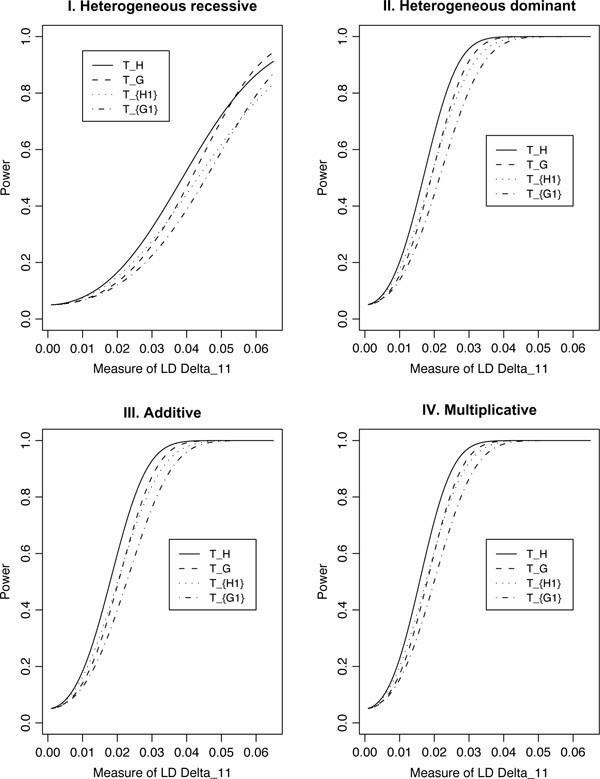 Each time, 5,000 simulated datasets are generated and each dataset contains N = 200 or 300 sibships under the assumption that there is no association between the marker(s) and the disease locus; a type I error rate is then calculated as the proportion of the 5,000 datasets for which the empirical test statistics are greater than, or equal to, the cut-off point at the significance level α = 0.01. The process is repeated 100 times. Thus, 100 type I error rates are calculated. The mean, standard deviation, minimum and maximum of the 100 type I error rates are presented in the entries of Tables 1, 2 and 3. Since the disease locus is not associated with the marker(s), the empirical test statistics which are greater than or equal to the cut-off point at the significance level α = 0.01 are treated as false positives. Thus, the type I error rates of Tables 1, 2 and 3 are empirical results. In Table 1, only sib-pairs are used in the calculations. In each sib-pair, one sibling is affected and the other one is normal. In Table 2, combinations of both sib-pairs and sibships of size 3 are used: the number of sib-pairs is equal to N/2; the number of sibships of size 3 is N/2; in each of N/4 sibships of size 3, one is affected and the other two are normal; in the remaining N/4 sibships of size 3, two are affected and the other one is normal. In Table 3, combinations of sib-pairs and sibships of sizes 3 and 4 are used: the number of sib-pairs is equal to N/2; the number of sibships of size 3 is N/5; and the number of sibships of size 4 is 3N/10; in each of N/10 sibships of size 3, one is affected and the other two are normal; in the remaining N/10 sibships of size 3, two are affected and the other one is normal; in each of N/10 sibships of size 4, one is affected and the other three are normal; in each of N/10 sibships of size 4, two are affected and the other two are normal; in the remaining N/10 sibships of size 4, three are affected and the other one is normal. From the results presented in Tables 1, 2 and 3, it is clear that T H has a lower type I error than T G . That is, the test statistic of the 'haplotype/allele coding' method has a lower type I error than the test statistic of the 'genotype coding' method. The 'haplotype/allele coding' method leads to more robust and reliable test statistics. The type I error rates of the test statistic of the 'haplotype/allele coding' method are reasonable for models I, II and III when N = 200. In addition, the type I error rates of the test statistic of the 'genotype coding' method are reasonable for models I and II when N = 200. The type I error rates of the test statistic for the 'genotype coding' method are slightly higher than the nominal level 0.01 for model III when N = 200 and become lower when N = 300. Note that the number of degrees of freedom for tests T G and T H is 3 and 9, respectively, for model III. Hence, the number of degrees of freedom for test T G is large for model III. When the number of degrees of freedom for tests is large, the asymptotic criteria can be problematic. In this case, a large sample is necessary to keep the type I error rates in a reasonable range. The results are similar in Tables 1, 2 and 3. Thus, the type I error rates are little affected by the varying structure of the sibships. The reason for this is that we basically take averages of the coding vectors for sibships whose size is larger than 2. To make power comparisons, we consider four genetic models: heterogeneous recessive, heterogeneous dominant, additive and multiplicative. For optimistic models, Table 4 gives penetrance probabilities taken from Nielsen et al. or Fan and Knapp [11, 19]. For less optimistic models, Table 5 lists penetrance probabilities taken from Fan and Knapp . For j = 1, ..., J, let us denote the measures of LD between allele H jk of the marker H j and the disease locus D by Δ jk = P(H jk D) - P(H jk )PD, k = 1, ..., n i . Here, P(H jk D) is the frequency of haplotype H jk D, and P(H jk ) is the frequency of allele H jk . For two bi-allelic markers H1 and H2, let Δ H 1 H 2 = P H 11 H 21 - P H 11 P H 21 be the measure of LD between the two markers, where P(H11H21) is the frequency of haplotype H11H21. Assume that the two markers H1 and H2 flank the disease locus D in the order H1DH2. Let Δ 1 D 2 = P H 11 D H 21 - P H 11 Δ 21 - P D Δ H 1 H 2 - P H 21 Δ 11 - P H 11 P D P H 21 be the measure of the third order LD . Here, P(H11DH21) is the frequency of haplotype H11DH21. First set of parameters of simulated genetic models. Second set of parameters of simulated genetic models. Figure 1 shows power curves of T H and T G against the measure of LD Δ11 at a significance level α = 0.05 using two bi-allelic marker H1 and H2, when P(Hi1) = P(Hi2) = 0.50, i = 1, 2, P D = 0.15 and N = 200 sib-pairs for the first set of parameters of the four genetic models of Table 4. The power curves of TH1 and TG1 are calculated based on one marker H1. In the graphs, Delta_11 = Δ11; the other parameters are given in the legend of the Figure. Figure 2 shows power curves of T H and T G against the measure of LD Δ11 at a significance level α = 0.05 using two bi-allelic marker H1 and H2, when P(Hi1) = P(Hi2) = 0.50, i = 1, 2, P D = 0.15 and N = 600 sib-pairs for the second set of parameters of the four genetic models listed in Table 5. Similarly to Figure 1, the power curves of TH1 and TG1 are calculated based on one marker H1. The other parameters are the same as those of Figure 1. Power curves of T H and T G at a significance level α = 0.05, using two bi-allelic markers H 1 and H 2 , when P ( Hi1) = P ( Hi2) = 0.50, i = 1,2, P D = 0.15, and N = 200 sib-pairs for the first set of parameters of the four genetic models of Table 4. The power curves of TH1 and TG1 are calculated based on one marker H1. In the graphs, Delta_11 = Δ11 = P(H11D) - P(H11)P D is a measure of linkage disequilibrium (LD) between marker H1 and disease locus D; in addition, the other parameters are given by Δ21 = P(H21D) 2 P(H21)P D = Δ11, ΔH1H2 = P(H11H21) - P(H11)P(H21) = 0.05; and Δ 1 D 2 = P H 11 D H 21 - P H 11 Δ 21 - P D Δ H 1 H 2 - P H 21 Δ 11 - P H 11 P D P H 21 = Δ 11 / 3 . Power curves of T H and T G at a significance level α = 0.05, using two bi-allelic markers H 1 and H 2 , when P ( Hi1) = P ( Hi2) = 0.50, i = 1,2, P D = 0.15 and N = 600 sib-pairs for the second set of parameters of the four genetic models of Table 5. The power curves of TH1 and TG1 are calculated based on one marker H1. In the graphs, Delta_11 = Δ11 = P(H11D) - P(H11)P D is a measure of linkage disequilibrium (LD) between marker H1 and disease locus D; in addition, the other parameters are given by Δ21 = P(H21D) - P(H21)P D = Δ11, Δ H 1 H 2 = P H 11 H 21 - P H 11 P H 21 = 0 . 05 , and Δ 1 D 2 = P H 11 D H 21 - P H 11 Δ 21 - P D Δ H 1 H 2 - P H 21 Δ 11 - P H 11 P D P H 21 = Δ 11 / 3 . From Figures 1 and 2, it is clear that T H generally has a higher power than that of T G . This is consistent with the results of Fan and Knapp for population case-control studies and Fan et al. for nuclear family data [19, 20]. This is most likely due to the large number of degrees of freedom of the test statistic T G . The power of T H (or T G ) based on two markers H1 and H2 is generally higher than that of TH1 (or TG1), which is only based on one marker H1. Hence, it is advantageous to use two markers rather than one marker in the analysis. This observation can be generalised -- that is, it is advantageous to use multiple tightly linked markers in analysis. Note that the number of degrees of freedom of test statistic T G can increase rapidly as the number of markers increases. This is particularly true when multi-allelic markers are used in analysis; but the number of degrees of freedom of T H only increases by one if one more bi-allelic marker is added to the analysis. Thus, T H has the advantage of high power when multiple markers are used; in addition, the number of degrees of freedom of T H would be not very large. For optimistic models in Table 4, the sample sizes required to achieve certain power levels are lower than those of the less optimistic models in Table 5. Not only can the test statistics T H and T G be applied to analyse the genetic data of the bi-allelic markers, but they can also be applied to analyse the genetic data of the multi-allelic markers. Figure 3 shows the power curves of T H and T G against the measure of LD Δ11 at a significance level α = 0.05 using a quadri-allelic marker H1, when P(H11) = P(H12) = 0.35, P(H13) = P(H14) = 0.15, P D = 0.15 and N = 200 sib-pairs for the first set of parameters of the four genetic models of Table 4. The other parameters are given in the legend of the Figure. Figure 4 shows power curves of T H and T G at a significance level α = 0.05 using a quadri-allelic marker H1, when P(H11) = P(H12) = 0.35, P(H13) = P(H14) = 0.15, P D = 0.15 and N = 600 sib-pairs for the second set of parameters of the four genetic models of Table 5. Similarly to Figures 1 and 2, T H generally has a higher power than that of T G .
Power curves of T H and T G at a significance level α = 0.05 using a quadric-allelic marker H 1 , when P ( H 11 ) = P ( H 12 ) = 0.35, P ( H 13 ) = P ( H 14 ) = 0.15 P D = 0.15 and N = 200 sib-pairs for the first set of parameters of the four genetic models of Table 4. Delta_11 = Δ11 = P(H11D) - P(H11)P D is a measure of linkage disequilibrium (LD) between marker H1 and disease locus D. In addition, Δ12 = -Δ11, Δ13 = -Δ14 = Δ11/2. The simulated power curves of ST H and ST G are calculated using combinations of both sib-pairs and sibships of size 3: the number of sib-pairs is equal to N/2 = 100; the number of sibships of size 3 is N/2 = 100; in each of N/4 = 50 sibships of size 3, one is affected and the other two are normal; in the remaining N/4 = 50 sibships of size 3, two are affected and the other one is normal. Power curves of T H and T G at a significance level α = 0.05 using a quadric-allelic marker H 1 , when P ( H 11 ) = P ( H 12 ) = 0.35, P ( H 13 ) = P ( H 14 ) = 0.15, P D = 0.15 and N = 600 sib-pairs for the second set of parameters of the four genetic models of Table 5. Delta_11 = Δ11 = P(H11D) - P(H11)PD is a measure of linkage disequilibrium (LD) between marker H1 and disease locus D. In addition, Δ12 = -Δ11, Δ13 = - Δ14 = Δ11/2. The simulated power curves of STH and STG are calculated using combinations of both sib-pairs and sibships of size 3 and sibships of size 4; the number of sib-pairs is equal to N/2 = 300; the number of sibships of size 3 is N/2 = 120; and the number of sibships of size 4 is 3N/10 = 180; in each of N/10 = 60 sibships of size 3, one is affected and the other two are normal; in the remaining N/10 = 60 sibships of size 3, two are affected and the other one is normal; in each of N/10 = 60 sibships of size 4, one is affected and the other three are normal; in each of N/10 = 60 sibships of size 4, two are affected and the other two are normal; in the remaining N/10 = 60 sibships of size 4, three are affected and the other one is normal. In addition to the power curves of T H and T G , which are based on sib-pair data, Figures 3 and 4 show the simulated power curves of ST H and ST G , which are based on sibships of varying structures. In Figure 3, combinations of both sib-pairs and sibships of size 3 are used to calculate the simulated power curves of ST H and ST G : the number of sib-pairs is equal to N/2 = 100; the number of sibships of size 3 is N/2 = 100; in each of N/4 = 50 sibships of size 3, one is affected and the other two are normal; in the remaining N/4 = 50 sibships of size 3, two are affected and the other one is normal. In Figure 4, combinations of sib-pairs and sibships of sizes 3 and 4 are used to calculate the simulated power curves of ST H and ST G : the number of sib-pairs is equal to N/2 = 300; the number of sibships of size 3 is N/5 = 120; and the number of sibships of size 4 is 3N/10 = 180; in each of N/10 = 60 sibships of size 3, one is affected and the other two are normal; in the remaining N/10 = 60 sibships of size 3, two are affected and the other one is normal; in each of N/10 = 60 sibships of size 4, one is affected and the other three are normal; in each of N/10 = 60 sibships of size 4, two are affected and the other two are normal; in the remaining N/10 = 60 sibships of size 4, three are affected and the other one is normal. To calculate the simulated power curves ST H and ST G , the interval (0, 0.045) of the LD measure Δ11 of LD is uniformly divided into 20 subintervals in Figures 3 and 4. Correspondingly, the 20 subintervals lead to 21 endpoints. For each endpoint, there is a set of parameters for each power curve. Using the set of parameters, 2,500 datasets are simulated for each endpoint. For each dataset, the empirical statistics T H and T G were calculated. The simulated power is the proportion of the 2,500 simulated datasets for which the empirical statistic is larger than the cut-off point of the corresponding χ2-distribution at a 0.05 significance level. From Figures 3 and 4, it can be seen that the simulated power ST H is generally higher than the power of T H , and the simulated power ST G is generally higher than the power of T G . Intuitively, sibships of large size contain more information than that of a sib-pair. The test statistics T H and T G can accurately capture the information contained in sibships of large size. Moreover, it can also be seen in Tables 1, 2 and 3 that the type I error is not inflated by including sibships of varying structure. To evaluate the accuracy of the non-centrality parameter approximations, we performed simulations for the power curves in Figures 1, 2, 3 and 4. The results are presented in the section: Supplementary information: Simulation study. It can be seen that the approximations are excellent. The goal of this study was to develop sibship-based Hotelling's T2 test statistics for high-resolution association mapping of complex diseases. This extends our previous research of paired Hotelling's T2 test statistics of nuclear family data or parent-offspring pairs . For late-onset complex diseases, parental data are usually not available. This motivated us to perform sib-pair or sibship analyses to study late-onset disorders. Based an two coding methods--'haplotype/allele coding' and 'genotype coding'--paired Hotelling's T2 test statistics T H and T G are proposed for high-resolution association studies, using normal sibs as controls for affected sibs. The test statistics can be applied to any number of markers, which can be either bi-allelic or multi-allelic. After power calculation and comparison, it was found that it is advantageous to use two markers rather than one marker in the analysis. This observation can be generalised -- that is, it is advantageous to use multiple tightly linked markers in analysis. The test statistic T H based on the 'haplotype/allele coding' method is generally more powerful than the test statistic T G based on the 'genotype coding' method. This is most likely due to the large number of degrees of freedom of T G . Moreover, the type I error rates of the test statistic T H are lower than those of test statistic T G .
For population case-control association studies, false-positive rates can be high due to inappropriate controls, which can occur if there is population admixture or stratification . Moreover, it is not always clear how to choose the appropriate controls. Alternatively, the parents or normal sibs can be used as controls of affected sibs [22, 26–29]. For parental/sibling controls, the methods proposed by Fan and Knapp  and Xiong et al. are not valid, since cases and controls are correlated with each other. The two sample Hotelling's T2 test statistics only take into account the correlation among markers [17, 19]. For sibship data, not only the correlation among the markers but also the correlation within each sib-pair needs to be taken into account. The paired Hotelling's T2 test statistics T H and T G developed in this paper correctly take both the correlation among the markers and the correlation within each sib-pair into account. The proposed method is potentially useful in association mapping of late-onset complex diseases. Cordell and Clayton  and Chapman et al. proposed logistic regression models for population-based case control studies or family studies. 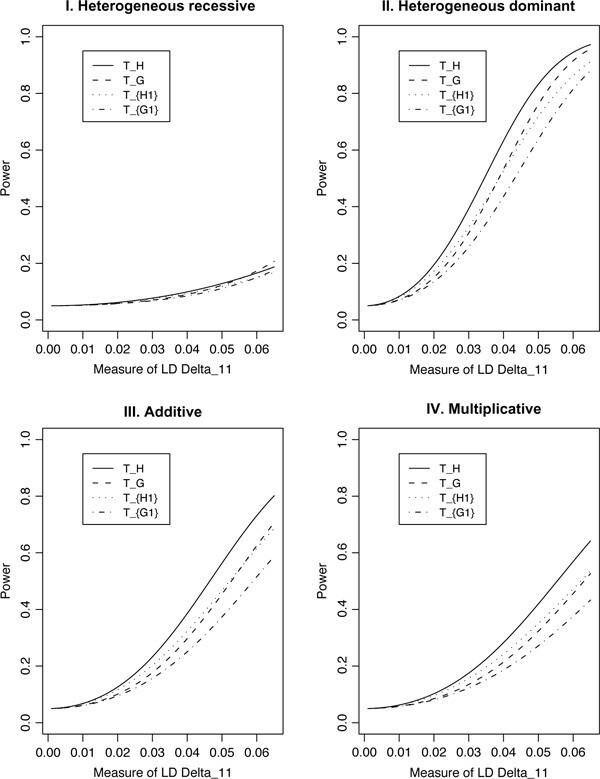 Both our proposed method and the logistic regression models can be used in association studies of multi-locus marker data. One advantage of the logistic regression models is that it is easy to add covariates to model the environmental effects, in addition to the genetic effects; however, it is not clear how to incorporate the environmental effects into our Hotelling's T2 test statistics. While we are able to calculate the non-centrality parameters for our T2 test statistics for power and sample size calculations, it is not clear if one might get similar results for the logistic regression models. In the study by Cordell and Clayton , the authors mainly discuss the analysis of SNP data and only briefly describe a way to analyse the multi-allelic markers data. We feel that more investigations are necessary in order for multi-allelic markers data to be used in the logistic regression models. By contrast, our proposed T2 can be used to analyse either bi-allelic or multi-allelic marker data, or both simultaneously. Moreover, more investigations are needed to make power comparisons of the two methods. In Figures 3 and 4, we show that the power of test statistics T H and T G based on combinations of sibships of varying structures are generally higher than the power of the test statistics based on sib-pairs. This is because the test statistics T H and T G use the average coding vectors for sibships whose sizes are larger than 2. This averaging strategy does not affect the mean of the coding vectors X ̄ A and Ȳ U , but it will lead to a variance-covariance matrix S, which increases the test statistics. Moreover, it can be seen from Tables 1, 2 and 3 that the type I error is not inflated by including sibships of varying structure. Although the proposed test statistics benefit from this, it is unlikely that they are optimal. One way would be to use weighted sibships in constructing test statistics. In this paper, we assume that there are no missing data. For practical genotype data, genotypic information may be missing at some markers for a portion of the sample . As a result, the methods used here need to be updated to address the problem of missing data. Another issue is that it is not clear how to combine population data, the nuclear family data and sibship data in one single analysis. In practice, the three types of genetic data can be available. They can be analysed separately, but it would be preferable to combine them in a unified analysis, which may lead to higher power. These issues needs more in-depth investigation. a j k k = P G i j A = H j k H j k | A 1 , U 2 = P G i j A = H j k H j k , A 1 , U 2 , 2 IBD ∪ 1 IBD ∪ 0 IBD / P A 1 , U 2 = 1 4 ∑ s , t ∈ D , d f s t f ̄ s t P H j k s P H j k t + 1 2 ∑ s , t , q ∈ D , d f s t f ̄ t q P H j k t P H j k s P q + 1 4 ∑ s , t ∈ D , d f s t P H j k s P H j k t Ā / P A 1 , U 2 .
ā j k k = P G i j U = H j k H j k | A 1 , U 2 = P G i j U = H j k H j k , A 1 , U 2 , 2 IBD ∪ 1 IBD ∪ 0 IBD / P A 1 , U 2 = 1 4 ∑ s , t ∈ D , d f ̄ s t f s t P H j k s P H j k t + 1 2 ∑ s , t , q ∈ D , d f ̄ s t f t q P H j k t P H j k s P q + 1 4 ∑ s , t ∈ D , d f ̄ s t P H j k s P H j k t A / P A 1 , U 2 . Note that ā j k k can be calculated by the formula for a jkk by substituting f st with f ̄ s t and vice versa. Note that the haplotype frequencies P(H jk D) = Δ jk + P(H jk )P D , P(H jk d) = -Δ jk + P(H jk )P d . Under the null hypothesis of no association between the markers H i , i = 1, 2, ..., J, and the disease locus D -- that is, Δ ij = 0 for all j, the haplotype frequencies are equal to the product of allele frequencies; for example, P(H jk D) = P(H jk )P D and P(H jk d) = P(H jk )P d . From equations (4) and (5), a j k k = ā j k k = P H j k 2 .
a j k l = P G i j A = H j k H j l | A 1 , U 2 = P G i j A = H j k H j l , A 1 , U 2 , 2 IBD ∪ 1 IBD ∪ 0 IBD / P A 1 , U 2 = 1 4 ∑ s , t ∈ D , d f s t f ̄ s t P H j k s P H j l t + P H j k t P H j l s + 1 2 ∑ s , t , q ∈ D , d f s t f ̄ t q P H j k t P H j l s + P H j k s P H j l t P q + 1 4 ∑ s , t ∈ D , d f s t P H j k s P H j l t + P H j k t P H j l s Ā / P A 1 , U 2 .
ā j k l = P G i j U = H j k H j l | A 1 , U 2 = P G i j U = H j k H j l , A 1 , U 2 , 2 IBD ∪ 1 IBD ∪ 0 IBD / P A 1 , U 2 = 1 4 ∑ s , t ∈ D , d f ̄ s t f s t P H j k s P H j l t + P H j k t P H j l s + 1 2 ∑ s , t , q ∈ D , d f ̄ s t f t q P H j k t P H j l s + P H j k s P H j l t P q + 1 4 ∑ s , t ∈ D , d f ̄ s t P H j k s P H j l t + P H j k t P H j l s A / P A 1 , U 2 . Note that ā j k l can be calculated by the formula for a jkl by substituting f st using f ̄ s t and vice versa. Under the null hypothesis of no association between the markers H i , i = 1, 2, ..., J, and the disease locus D -- that is, Δ ij = 0 for all j, the haplotype frequencies are equal to the product of the allele frequencies; for example, P(H jk D) = P(H jk )P D , P(H jk d) = P(H jk )P d , P(H jl D) = P(H jl )P D and P(H jl d) = P(H jl )P d . From equations (4) and (5), a j k l = ā j k l = 2 P H j k P H j l . Therefore, the expectation E X ̄ A - Ȳ U | A 1 , U 2 = 0 for the 'genotype coding' method. E z i j k A | A 1 , U 2 = 2 a j k k + ∑ l ≠ k a j k l , E z i j k U | A 1 , U 2 = 2 ā j k k + ∑ l ≠ k ā j k l .
From equation (6), expectation E z i j k A - z i j k U | A 1 , U 2 = 2 P H j k - 2 P H j k = 0 by 'haplotype/allele coding' method, under the null hypothesis of no association between the markers H i , j = 1, ..., J and disease locus D.
Consider N sib-pairs, each consisting of an affected sibling and a normal sibling. For convenience, assume that the first sibling is affected and the second sibling is normal in each sib-pair. Let us denote A1 = (the first sibling is affected), U2 = (the second sibling is unaffected). For 'haplotype/allele coding', the coding vector of the affected sibling in the i-th sib-pair is X i A = z i 11 A , … , z i 1 n 1 - 1 A , … , z i J 1 A , … , z i J n J - 1 A τ . Similarly, Y i U = z i 11 U , … , z i 1 n 1 - 1 U , … , z i J 1 U , … , z i J n J - 1 U τ is the coding vector of the normal sibling. Denote the variance-covariance matrix of X i A - Y i U by ∑ h a p = Var X i A - Y i U | A 1 , U 2 = Var X i A | A 1 , U 2 - Cov X i A - Y i U | A 1 , U 2 - Cov Y i U , X i A | A 1 , U 2 + Var Y i U | A 1 , U 2 . The elements of the above variance-covariance matrices are given in Appendices A, B, and C: Var X i A | A 1 , U 2 and Var Y i U | A 1 , U 2 in Appendix A, and Cov X i A - Y i U | A 1 , U 2 in Appendices B and C. Using quantities of E Z i j k A | A 1 , U 2 and E Z i j k U | A 1 , U 2 in the Appendix to the manuscript, E X i A - Y i U | A 1 , U 2 can be calculated. The non-centrality parameter λ H of Hotelling's statistics T H is given by λ H = N E X i A - Y i U | A 1 , U 2 τ ∑ h a p - 1 E X i A - Y i U | A 1 , U 2 . E Y i j U | A 1 , U 2 = ā j 11 , … , ā j n j - 1 n j - 1 , ā j 12 , … , ā j 1 n j , … , ā j n j - 1 n j τ . Using E X i j A | A 1 , U 2 and E Y i j U | A 1 , U 2 , one may calculate the expectation E X ̄ A - Ȳ U | A 1 , U 2 = E X i 1 A - Y i 1 U | A 1 , U 2 τ , … , E X i J A - Y i J U | A 1 , U 2 τ τ . Let ∑ g e n o = Cov X i A - Y i U | A 1 , U 2 = Var X i A | A 1 , U 2 - Cov X i A - Y i U | A 1 , U 2 - Cov Y i U , X i A | A 1 , U 2 + Var Y i U | A 1 , U 2 be the variance-covariance matrix of X i A - Y i U . Then the non-centrality parameter λ G of Hotelling's statistics T G is given by λ G = N E X ̄ A - Ȳ U | A 1 , U 2 τ ∑ g e n o - 1 E X ̄ A - Ȳ U | A 1 , U 2 . The elements of the above variance-covariance matrices are given in Appendices D and E: Var X i A | A 1 , U 2 and Var Y i U | A 1 , U 2 in Appendix D, and Cov X i A - Y i U | A 1 , U 2 in Appendix E.
Var Y i U | A 1 , U 2 = Var z i 11 U , … , z i 1 n 1 - 1 U , … , z i J 1 U , … , z i J n J - 1 U τ | A 1 , U 2 . Var z i j k U | A 1 , U 2 = E z i j k U 2 | A 1 , U 2 - E z i j k U | A 1 , U 2 2 = 4 ā j k k + ∑ l ≠ k ā j k l - 2 ā j k k + ∑ l ≠ k ā j k l 2 . Cov z i j k U , z i j l U | A 1 , U 2 = E z i j k U z i j l U | A 1 , U 2 - E z i j k U | A 1 , U 2 E z i j l U | A 1 , U 2 = ā j k l - 2 ā j k k + ∑ k ′ ≠ k ā j k k ′ 2 ā j l l + ∑ l ′ ≠ l ā j l l ′ . g k k ′ h h ′ A , j g = E 1 G i j A = H j k H j k ′ 1 G i g A = H g h H g h ′ | A 1 , U 2 = P G i j A = H j k H j k ′ , G i g A = H g h H g h ′ , A 1 , U 2 , 2 IBD ∪ 1 IBD ∪ 0 IBD / P A 1 , U 2 = 1 4 ∑ s , t ∈ D , d f s t f ̄ s t P G i j A = H j k H j k ′ , G i g A = H g h H g h ′ , G i D A = s t , G i D U = s t + 1 2 ∑ s , t , q ∈ D , d f s t f ̄ t q P G i j A = H j k H j k ′ , G i g A = H g h H g h ′ , G i D A = s t , G i D U = t q + 1 4 ∑ s , t , q , r ∈ D , d f s t f ̄ q r P G i j A = H j k H j k ′ , G i g A = H g h H g h ′ , G i D A = s t , G i D U = q r / P A 1 , U 2 = 1 4 ∑ s , t ∈ D , d f s t f ̄ s t P H j k s H g h P H j k ′ t H g h ′ + P H j k t H g h P H j k ′ s H g h ′ + P H j k s H g h ′ P H j k ′ t H g h + P H j k t H g h ′ P H j k ′ s H g h + 1 2 ∑ s , t , q ∈ D , d f s t f ̄ t q P H j k s H g h P H j k ′ t H g h ′ + P H j k t H g h P H j k ′ s H g h ′ + P H j k s H g h ′ P H j k ′ t H g h + P H j k t H g h ′ P H j k ′ s H g h P q + 1 4 ∑ s , t ∈ D , d f s t P H j k s H g h P H j k ′ t H g h ′ + P H j k t H g h P H j k ′ s H g h ′ + P H j k s H g h ′ P H j k ′ t H g h + P H j k t H g h ′ P H j k ′ s H g h Ā / P A 1 , U 2 .